Anyone who has known Ken Huddleston for any length of time knows that he has always been a firm believer that size does matter. 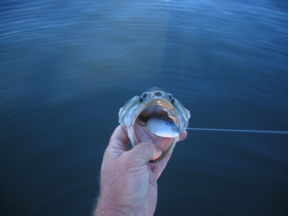 In fact, I have heard him say on more than one occasion that you should increase the size of your bait when the bite gets tough rather than following the more popular and conservative approach of decreasing the size of your offering during a tough bite. And while Ken’s belief may go against the grain of all logic and common sense, I can tell you first hand that his way of thinking works and will occasionally land you in the winner’s circle. So why, then, would one of the country’s most successful big swimbait designers take a detour from his own well beaten path and design a small shad imitating swimbait? My answer is simple: Who cares? I just thank God that he did! Following in the footsteps of his very popular Huddleston Deluxe trout swimbaits and his equally successful Huddlebug crawdad baits, Ken Huddleston has come out with a series of new shad imitating swimbaits called the Huddleston Shad. These new baits are 4 1/2 inches long and feature the exact same swimming action tail as the Huddleston Deluxe trout swimbaits. The Huddleston Shad swimbaits come in five life-like colors that include Green Shad, Blue Shad, Lavender Shad (my personal favorite), Black Back Shad, and Golden Shad, and look incredibly real when worked through the water. Like their trout swimbait cousins, the Hudd Shads (as I call them) utilize the same rating system called the “Rate of Fall” (ROF). They currently come in an ROF-3 and an ROF-12, with an ROF-16 in the prototype stage. I recently had an opportunity to field test the new Hudd Shads at Clear Lake (like I really needed a reason to go to Clear Lake). After having a large follower on my very first cast of the morning, I caught a five pound Clear Lake largemouth bass on my second cast with a Black Back ROF-12 Hudd Shad. (I know that this sounds like a fish story, but it is the absolute truth and was witnessed by my very good friend Jim Tatum, who accompanied me on this trip). Within an hour, I caught a four pounder and had several more bites on the bait. As the sun rose higher in the sky, I switched to the Lavender Shad (in ROF-12). I threw the bait between some grass clumps and was promptly greeted with a textbook double thump swimbait bite. I set the hook and quickly boated a hefty 7 pound 4 ounce beauty, which would prove to be my largest Hudd Shad fish of the four-day trip. Over the course of my four-day trip, I caught over a dozen fish on the new Huddleston Shad swimbaits in every color, with the Lavender Shad and Blue Shad being the most successful for me. I fished the swimbaits on a Dobyns Rods DX 764C Champion Xtreme rod and a Shimano Chronarch SF reel spooled with 15 pound test Seaguar Inviz X fluorocarbon line. 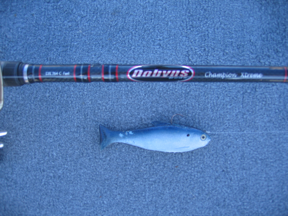 This 7’6” rod allowed for extremely long casts, yet had enough power and backbone to set the hook, even with a lot of line out. What I found: While the hook may appear too small, in all honesty it is not. When I spoke with Ken about this issue, he said that it has been his experience that big bass are extremely wary of anything out of the ordinary, including hook size. (His exact words were “hook shy”). While he certainly could have used larger hooks in his new Shad swimbaits, doing so might prevent a big bass from biting the bait. The thing that you really need to remember is that the Huddleston Shad is a swimbait and when you get bit on it, you MUST set the hook just as you would with any other swimbait. If you set the hook as you would with a crankbait, spinnerbait, or jerkbait (which is generally more of a pulling while cranking type of hook set), you will probably lose the fish. With all swimbaits, you must set the hook very hard. Nearly every fish that I caught on the Huddleston Shad swimbaits were hooked exceptionally well, usually in the roof of the mouth or (better yet) in the corner of the mouth. Another thing to remember is that it is not a good idea to fight a fish that is caught on a swimbait. You are far better off horsing them to the boat. The longer you give a big bass an opportunity to throw your swimbait, the greater the chance that it will happen. Nearly every fish that I caught on the Huddleston Shad swimbaits were hooked exceptionally well, usually in the roof of the mouth or (better yet) in the corner of the mouth. Issue-2: “I miss a lot of fish on Huddleston Shad swimbaits”. What I found: I got A LOT of bites on this bait, yet I would hook maybe one fish in ten bites. The smallest fish that I caught on the bait was a two pounder. It is my belief that the many bites that I got where I did not hook the fish were probably smaller fish (at least smaller than two pounds). I attribute this belief to the fact that the tail portion of the bait was “raked” with teeth marks, indicating that the tail was being bitten, but the fish were not getting to the hook. What I found: Get over it. The best bass that I caught on the Huddleston Shad were very tight to the cover (go figure). The Hudd Shad is actually quite weedless and comes through the tules and grass rather well. Most of my better fish were caught just as the bait cleared the tules or grass clumps. Of course, I also had tremendous success throwing the bait in open water and around dock pilings. I’m telling you, the fish cannot resist this bait, regardless of the type of structure you are fishing. Although the Hudd Shad is a “high-maintenance bait” when fished around grass, it is far less so than say a jerk bait or a crankbait. If there is even the slightest amount of grass or other debris on the bait when you get it back to the boat, I strongly recommend that you take a few seconds to remove it from the bait before making your next cast. At one point during my trip, Jim was reeling in a nice fish and there were three better fish following right behind it. (Man I hate when that happens!). I quickly pitched my Hudd Shad at the followers and they charged right up to it but did not eat it because there was a small amount of muck on the hook. I seriously believe that one of these fish would have eaten the bait had it been free of debris. What I found: Although the bait does have a tendency to roll slightly when retrieved quickly, you can reduce this by adjusting your knot placement slightly. Ken recommends using a Trilene knot on his Shad swimbaits because it is a very straight knot. He informed me before my trip that you can reduce the rolling by moving the knot slightly in the same direction that the bait is rolling to (this is in contrast to what you would do with a crankbait that does not run true). While this may sound backwards, I found it to be 100% accurate (don’t ask me why). While you would think that the ROF-3 would be the best choice for waking the bait, I actually had better success waking an ROF-12. Most of my wake bites came right when I “killed” the bait (paused briefly during my retrieve). Most of the bites that I got on the ROF-3 occurred when I could visually see large balls of baitfish. I would throw the Hudd Shad beyond the baitfish and slowly retrieved it right through the baitfish. When you get bit doing this, the fish will knock your fillings loose. It is a ton of fun. What I found: I found this to be very true, but usually only after hooking a good fish (a pretty good tradeoff if you ask me). However, I also found is that you can easily repair the bait by pushing the insert back into the bait and using a little Super Glue to seal the tear in the “skin”. What I found: Oh yes they are - once you scrape the paint off of them. Like the Huddleston Deluxe trout swimbaits, the Hudd Shads are hand painted. During the painting process, some paint gets onto the hook. You absolutely must remove this paint before using the bait. I always carry a small pocket knife and use it to scrape the hooks clean. It is a very quick and easy process. Once you get it started, you can pull the excess paint off with your fingers. You should also do this to the line-tie, as well. I can say with the utmost of confidence that the new Huddleston Shad swimbaits will soon be winning a lot of tournaments (perhaps they already have). 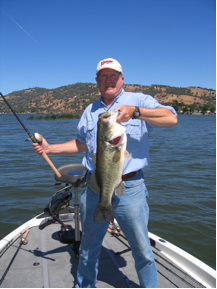 And even thought they are relatively small in size and will catch a lot of two to five pound bass, they are very capable of catching very large bass, as well. During our four-day trip to Clear Lake, Jim Tatum and I caught upwards of 150 bass on a variety of baits, but the largest bass of the trip was the 7-4 that I caught on the Huddleston Shad. I encourage all of you to give the new Huddleston Shad swimbaits a try, as they are a lot of fun to fish and keep you in a position to possibly catch the bass of a lifetime. 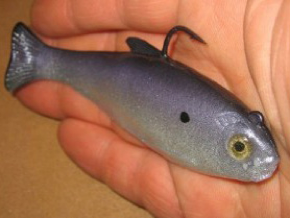 You can read more about the Huddleston Shad swimbaits and view a short video clip of the bait on the Huddleston Deluxe website at: http://www.huddlestondeluxe.com.